All investors know the risks of biotechnology companies. The strong volatility of these companies makes their prices fluctuate in excess. This sector has the peculiarity that offers a high risk but with a possible high gain. Identify pharmaceutical companies that have bottomed out or that are undervalued can be a good investment strategy for medium-term and short-term. In the following table will be able to see the readers, 3 companies which have greatly reduced their quoted prices since on January 6, 2017. As you have seen in the upper table these companies have been hit hard during July, 2017. To determine if these companies are undervalued I have made a fundamental analysis of each company. 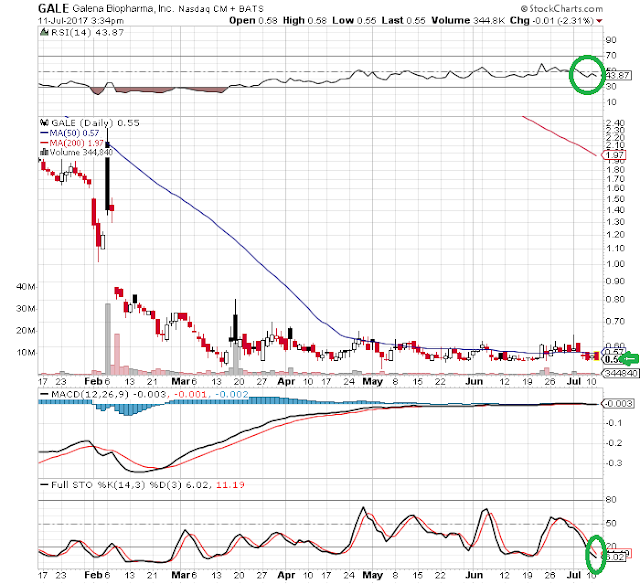 Galena Biopharma Inc (NASDAQ: GALE) is a biopharmaceutical company. The Company focuses on developing and commercializing targeted oncology therapeutics that address unmet medical needs. The Company's development portfolio ranges from mid- to late-stage clinical assets. 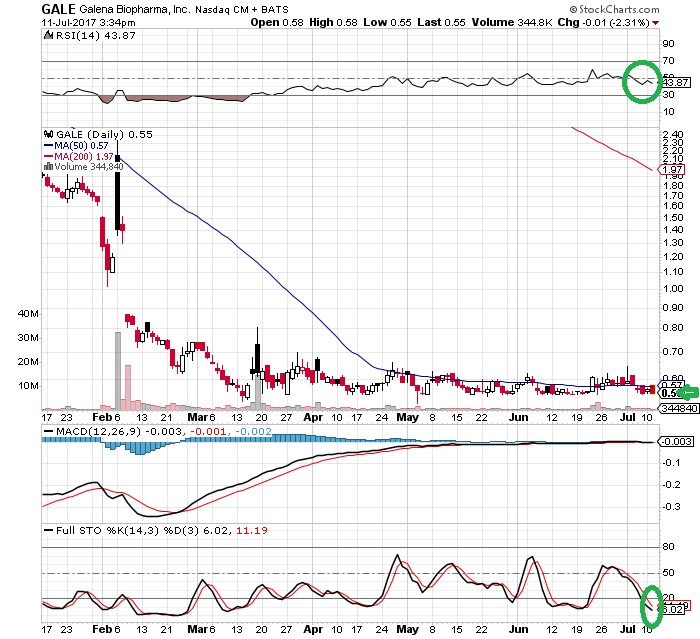 Galena lead product candidate is GALE-401. This product contains the active ingredient anagrelide, an FDA-approved product, for the treatment of patients with myeloproliferative neoplasms ("MPNs") to lower abnormally elevated platelet levels. The currently available immediate release ("IR") version of anagrelide causes adverse events that are believed to be dose and plasma concentration dependent, and may limit the use of the IR version of the drug. Therefore, reducing the maximum concentration ("Cmax") and increasing the half-life of the drug is hypothesized to reduce the side effects, while preserving the efficacy, potentially allowing a broader use of the drug. Galena Biopharma has a market cap of $21.18 million. Its trailing P/E is 2.51. It has a total cash position on its balance sheet of just $42.046,Million. The company announced a revenue on three months ended March 31 of $0. This stock plunged from its high of $4.75 to a recent low of $0.16. If you are bullish on this stock, I would look to be a buyer on the next high-volume move above some near-term overhead resistance at $0.58 a share. 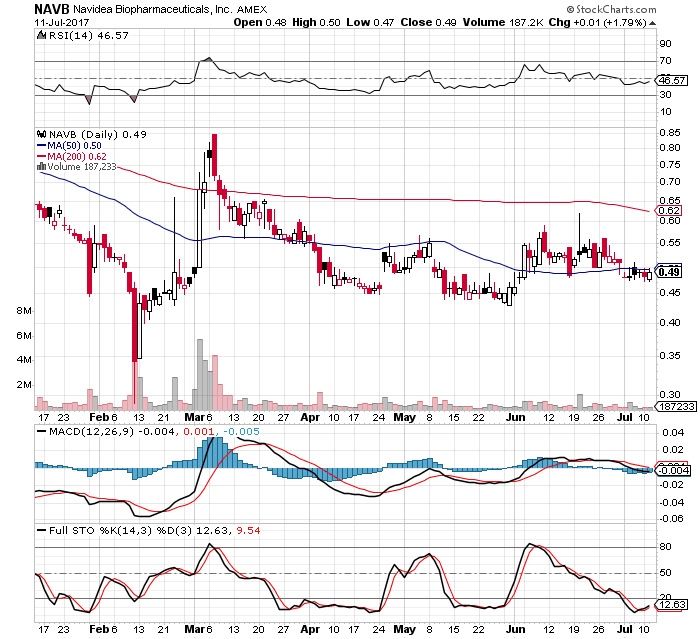 Look for volume that's tracking in close to or above its three-month average action of 599,062 shares. Keep in mind that the company has approved the possibility of performing a reverse split recently. Repros Therapeutics Inc (NASDAQ: RPRX) is a biopharmaceutical company focused on the development of new drugs to treat hormonal and reproductive system disorders. The Company's product candidates include enclomiphene, which is a single isomer of clomiphene citrate, an orally active small molecule compound, and Proellex, which is an orally administered selective blocker of the progesterone receptor in women, for the treatment of uterine fibroids and endometriosis. 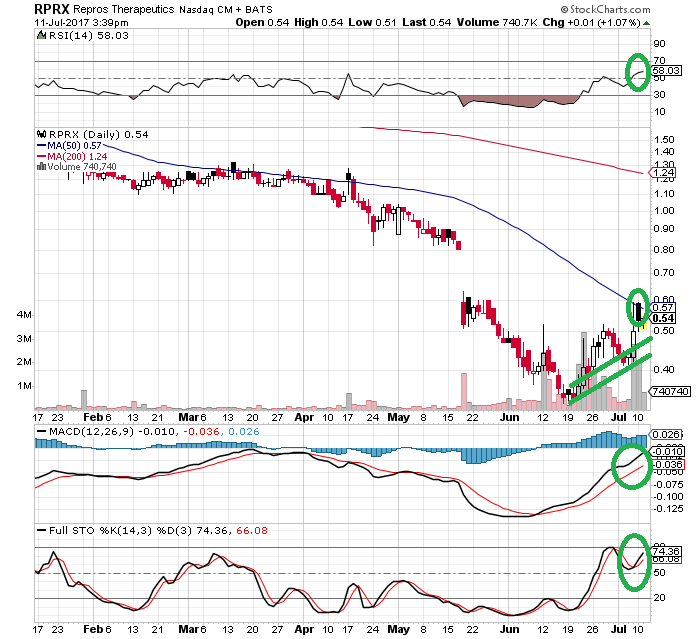 Repros Therapeutics has a market cap of $16.98 million. Its trailing P/E is incalculable and its forward P/E is just incalculable as the majority of pharmaceutical companies of small-capitalization. It has a total cash position on its balance sheet of just $3.23 Million. The company announced a revenue on three months ended March 31 of $0. This stock plunged from its high of $2.48 to a recent low of $0.33. If you are bullish on this stock, I would look to be a buyer on the next high-volume move above some near-term overhead resistance at $0.58 a share. Look for volume that's tracking in close to or above its three-month average action of 905,240 shares. Navidea Biopharmaceuticals Inc (NYSEAMEX: NAVB) is a biopharmaceutical company focused on the development and commercialization of precision immunodiagnostic agents and immunotherapeutics. The Company is developing multiple precision-targeted products based on the Manocept platform to help identify the sites and pathways of undetected disease. Navidea has a market cap of $78.10 Million. Its trailing P/E is incalculable and its forward P/E is just incalculable as the majority of pharmaceutical companies of small-capitalization. It has a total cash position on its balance sheet of just $13.44 Million. The company announced a revenue on three months ended March 31 of $580,000. This stock plunged from its high of $1.16 to a recent low of $0.26. If you are bullish on this stock, I would look to be a buyer on the next high-volume move above some near-term overhead resistance at $0.50 a share. Look for volume that's tracking in close to or above its three-month average action of 386,176 shares. Disclosure: Jorge Aura has no positions in any stocks mentioned, and no plans to initiate any positions within the next 72 hours. Jorge Aura wrote this article himself, and it expresses his own opinions. He is not receiving compensation for it. Jorge Aura has no business relationship with any company whose stock is mentioned in this article. The post is truly great, I appreciate your intention to explain all issues you've encountered with! Knowing the risks of biotechnology companies, we can simply set up particular strategies to avoid different issues. Neomedia Technologies: Apple and Microsoft be interested? This blog represents Jorge Aura's personal opinion about stocks. The information in these articles is taken from sources believed to be reliable, and frequently includes snips from direct conversations with management. However, there can be no guarantee that any information provided is accurate or timely. Investing in stocks is highly speculative and risky. I encourage everyone to do their own proper due diligence and consult with a qualified or certified financial planner. Bolsatrading 2012. Powered by Blogger.